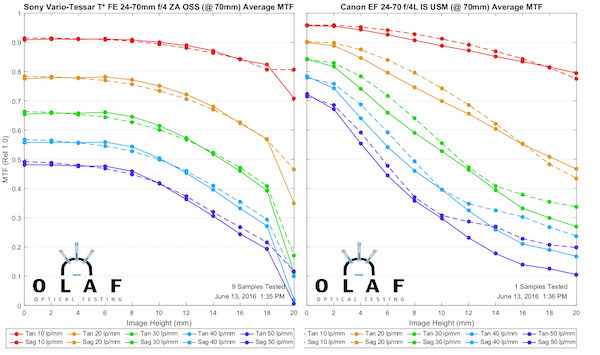 Many of you who have followed along as we beta-test our Sony FE lens testing have been asking where the FE 16-35mm f/4 ZA OSS and the FE 24-70mm f/4 ZA OSS test results are. Well, the answer is they are here. But your other question, why has it taken so long, has a more complex answer. Testing FE lenses are much more difficult than testing standard photo lenses. The electronic focusing mechanisms required us to make some major modifications to our testing bench. The baffles in FE mounts clips some data on the edges, making the testing process more difficult. FE lenses, having a short backfocus distance are more sensitive to the amount of optical glass in the imaging pathway. And, most recently, distortion curves and copy variation among some of these lenses made us question our results and testing methods, sending us back to redo a lot of data and taking up a couple of months of our time. Finally, no, we still aren’t quite done determining a ‘variation’ or ‘consistency’ number formula that we’re completely happy with, so there won’t be numbers for a while longer. You’ll also notice the FE variation graphs are different than what we’re using for other lenses. So first, let’s get a good look at what the two new zooms look like on the optical bench. 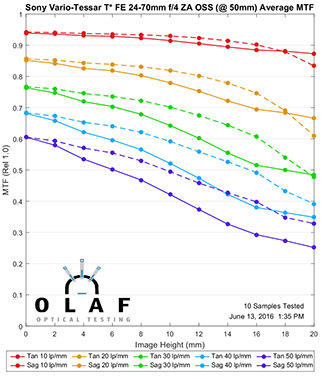 Remember when we test FE lenses we get some clipped data because of the baffle in the lens so while data from the center to 14mm is an average of 8 measurements for each lens, the data at 18 and 20mm is generally 4 measurements per lens. It sometimes makes the curves look a bit odd at the edge, and we encourage you to not get overly analytical about the 20mm data. We have some nice comparison lenses to use here: the Canon 16-35mm f/4 IS and the Nikon 16-35mm f/4 VR. Below are the MTF curves for each at 16mm, 24mm, and 35mm. As usual, Zach has done his magic so you can enlarge the graphs to see them better. At 16mm, all 3 lenses are good in the center, with the Sony being better than the other two at higher frequencies. The Nikon develops ‘astigmatism-like’ patterns fairly close to center while the Canon and Sony hold together well till about halfway to the edge of the image. In the corners the Sony, while quite astigmatic, maintains sharpness quite well. At 24mm things repeat somewhat, although here the Nikon is doing better at this focal length and is in some ways better than the Canon here. There is an odd ‘bounce-back’ in the Canon MTF at 20mm. It looks like an artifact, but it’s repeatable and consistent copy-to-copy, so I really don’t know that we can accept those 20mm (edge) readings at face value; the MTF graph may be a bit better than the real world. But again, the Sony appears to be slightly the best of the three. At 35mm, the Canon is at it’s best. The Nikon and Sony aren’t quite as good here, although I want to be clear, these are all really good performances for wide zoom lenses. Overall we’d have to say the Sony has the best MTF at the 16mm, particularly at higher frequencies, while the Canon is a bit better at 35mm. The Nikon is at its best at 16mm but doesn’t hold up quite as well at longer zoom ranges. The Sony, as all Sony shooters have come to expect, is more expensive than the other two, although not hugely more. In this case, though, it’s at least as good, and in some areas better, than the others. It’s a really good lens. I like to tell you my expectations pre-testing. In this case, I thought that wide-angle zooms tend to vary a lot, and Sony FE lenses tend to vary a lot, so I thought the Sony FE 16-35 f/4 would, duh, have a lot of copy-to-copy variation. Before we get to the graphs, let me repeat that these are different than what we’ve used in the past. In the old graphs, we doubled the Y axis so we could show all 5 frequencies we measured. Now we’re leaving the Y axis from 1 to 1, just like the MTF graph and showing you 3 frequencies: 10, 30, and 50 line pairs/ mm. We think this gives a more intuitive picture of what the MTF of a given copy should look like. The lines in the center are MTF lines and should look the same as the MTF graphs, while the colored area is the range we expect typical copies to fall in. We know from previous testing that variation for the Canon and Nikon 16-35 f/4s are pretty good as zoom lenses go; not great, but good. The Sony 16-35 f/4 OSS has very similar to a bit less variation at the wide end and very similar to a bit worse variation on the long end. Overall, both from an MTF and a copy-to-copy variation standpoint, the Sony FE lens is as good as, and sometimes better than, the Canon and Nikon offerings. The 24-70 f/4 has been a very difficult lens for us to test for several reasons. One of the major reasons was distortion. The distortion figures we got testing it on the optical bench were quite different than what is reported for it. I don’t know exactly why, and I don’t intend to speculate here. But most importantly, there was some copy-to-copy variation in distortion which is rather unusual. We finally ended up testing by running a distortion curve for each copy at each focal length, testing the MTF, then repeating. It made the testing really lengthy and drawn out. I mention it to be clear that testing this lens irritated me and I am therefore predisposed not to like it. I also point out that because of all this I am a bit uncertain with our testing methods with this lens. We’ve repeated measurements numerous times and I’m comfortable that the results are reproducible. But whenever something is weird and I don’t quite understand why, I’m always hesitant about publishing the results. But people keep asking, so here you go. Just keep in mind that there’s something about this lens I don’t understand so we may be missing something. The logical comparison for the Sony 24-70 f/4 is the Canon 24-70 f/4 IS L lens. Unfortunately, I only have new-method results for the Canon at 24mm and 70mm, so you’ll have to cope with not having a 50mm comparison. 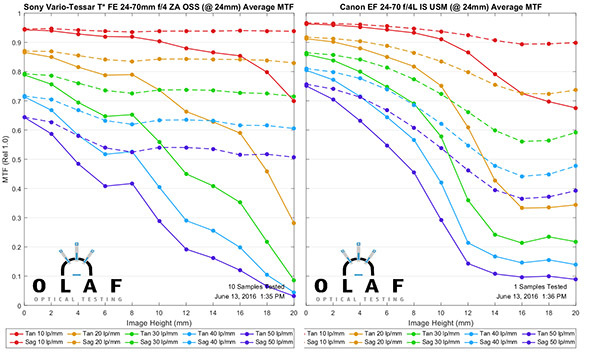 But here’s the MTF curves for the Sony at three focal lengths, compared to the Canon at two. As you can see, the Canon is clearly better at the 70mm end, and better at the 24mm end. The Sony, however, is at it’s best at 50mm in the center of its zoom range, especially off axis where it maintains sharpness with very little astigmatism all the way to the edge of the field. For a slightly different comparison, below are the Sony FE 16-35 f/4 and Sony FE 24-70 f/4 both measured at 24mm. The 16-35 f/4 is clearly better. From an MTF point of view, the FE 24-70mm f/4 OSS is OK, but certainly not great. 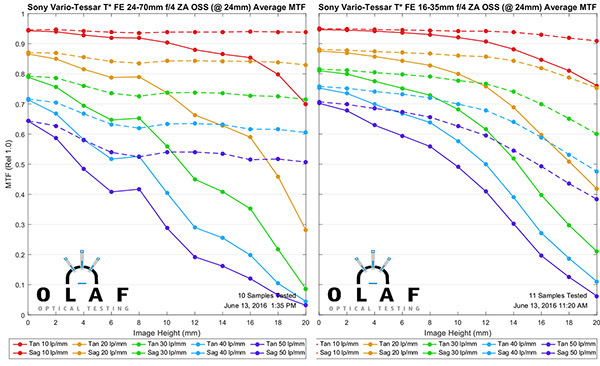 We’ll start with the variance curves for the Sony FE 24-70mm f/4 at the three different focal lengths we tested. It really is pretty good at 24mm and 50mm, but there is a bit of worrisome center variation at 70mm. (Center variation is associated with an overall sharpness difference, where off-axis variance often indicates more of a tilt.) For a zoom, though, this isn’t a bad performance, as we’ll see below. The Canon 24-70mm f/4 IS again only has curves at 24mm and 70mm. As you can see in the graphs below, off-axis it has more variance than the Sony, but doesn’t exhibit the center variance at 70mm that the Sony did. The Sony FE 16-35 f/4 we saw earlier looks similar too. So the bottom line is while there is definitely some copy-to-copy variation among the Sony f/4 zooms, it doesn’t really appear worse than most zoom lenses. I will say I’m pleasantly surprised. The Sony FE 24-70mm f/4, while not a great lens is adequate (note I didn’t say adequate for the price, I said adequate) and its copy-to-copy variation isn’t bad. The Sony FE 16-35mm f/4 actually is excellent for an ultra-wide zoom, and again, it seems to have decent sample variation. Would I buy them? Probably not the 24-70 f/4 unless I had no options, but I wouldn’t hesitate on the 16-35mm f/4. I realize we’ve put out our Sony FE test results in bits and pieces, working through a lot of problems and figuring things out. That’s what this blog is about: trying to figure things out and showing them to you as we go along. But I also realize a lot of you want that information without having to Google 6 different articles to find the test results you’re looking for. So in the next week or so I’ll put out a summary article just showing all the FE MTF and variation charts in one place. i knew FE1635 is an awesome uwa…i cant live without it. Can I also vote for the 16-70mm f4 E as it’s an extremely useful focal length but scarily expensive, so is it in any way okay value? Zig, I’ve been feeling the historical urge for a while. I was thinking about Land, but it’s too much and too much disagreement to do a post on. Suggestions welcome. Thanks a lot for another outstanding MTF report, but don’t you think that in the FE24-70/4 summary you should trade the adjective chosen for something more proper or add a referral point since nothing can be adequate on its own, but only relatively to something else. I feel like I’m missing your historical essay which you haven’t come up with for quite a long. Dear Mr. Busy Bee, have you got any plans/ideas for a one? I attached a sample of the upcoming legend. There are still some things to be done, as implementing a custom legend has caused quite a horrific number of internal bugs in our plotting package to become exposed, and we must work around them (e.g. the messed up aspect ratio of the image). But, it should be out sometime in the near or near-ish future. The dashed curve has always been sagittal, as you will find indicated on the attached image. Hi, is there any chance we could get a clearer distinction in the legend between the tangential and sagittal curves? Even viewing the images at full size I cannot tell which one is supposed to be dashed and which solid. actually, the above poster brings up a good point. cheaper apsc/zoom lenses have far more users. As an example, the Nikkor 18-140 dx, is one of the most popular kit lenses among Nikon apsc users. the lens gets relatively good reviews every where and my own experience confirms that except in one case. the infinity focus at 18 mm is horrible. its not good at the long end either. now, I do not know if this is a problem with my copy or everyone’s. and as you repeatedly point out, DXO’s results are analyzed from closer than infinity. I believe an analysis from your side on sony/canon/nikon kit lenses can be very very useful for camera system buyers/renters. Ron, we want to get to everything, but our workload is such that we only have a limited amount of time for this testing. Someday soon, I hope to, though. As usual a most informative analysis. I know most people are interested in the FE lenses for Sony but as an A6000 and A6300 user I have a greater interest in the APS-C lenses. 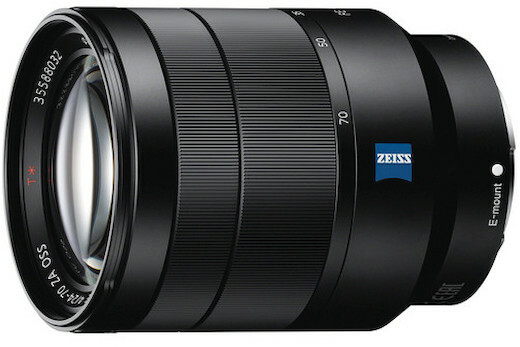 Having both the Zeiss Touit 32mm and 55mm lenses I am interested in the Touit 12mm but more so in the Zeiss branded 16-70mm zoom which I have yet to buy. How does it compare to the kit 16-55mm that came with my A6300 and to others for other camera makes? I hope you can find the time to look at these lenses too. I do understand though if that does not fit your needs. Regards and thanks for all the great information on your blog.